1). Pressure cook dal with 1 cup of water, turmeric powder and castor oil for 3 whistles. Once pressure releases, mash the dal well with a masher and keep aside. Soak tamarind in hot water, extract juice and discard the pulp. Rinse. peel the skin and cube the plantain. Keep it immersed in water until use to prevent discoloration. 2). Heat a tbsp of ghee/oil, add mustard, when it splutters, add hing, curry leaves, fenu greek, finely chopped onions and saute for few minutes. Then add cubed plantain and mix. 3). Add turmeric powder, chilli powder and sambar powder and mix. Then add tamarind extract along with salt. Let it boil until the raw smell of the tamarind and the sambar powder goes. 4). Add the mashed dal along with needed water and bring it boil in a low flame. When plantain becomes tender and sambar reaches thick consistency, switch off and garnish with coriander leaves. Relish the sambar with appalam and poriyal..
# Read it somewhere:- When cooking rice, reserve the water used for washing the rice. Immerse the cubed plantain in that rice water to avoid stickiness. 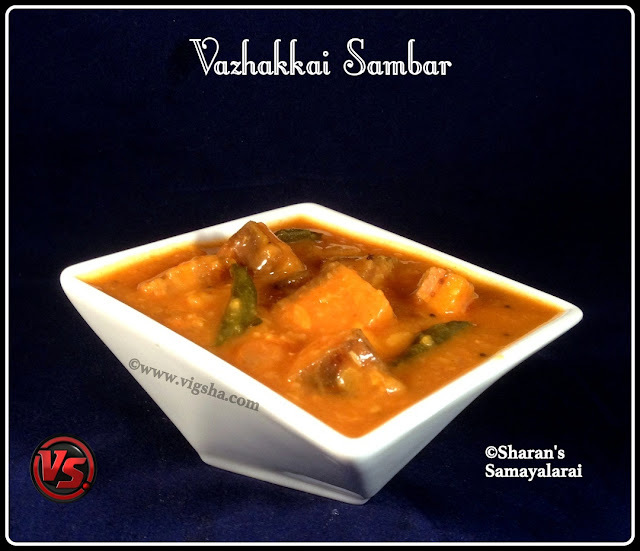 # Do not over cook the vazhaikkai and make it mushy. # For faster cooking, soak the dal in water for 30 minutes before cooking.